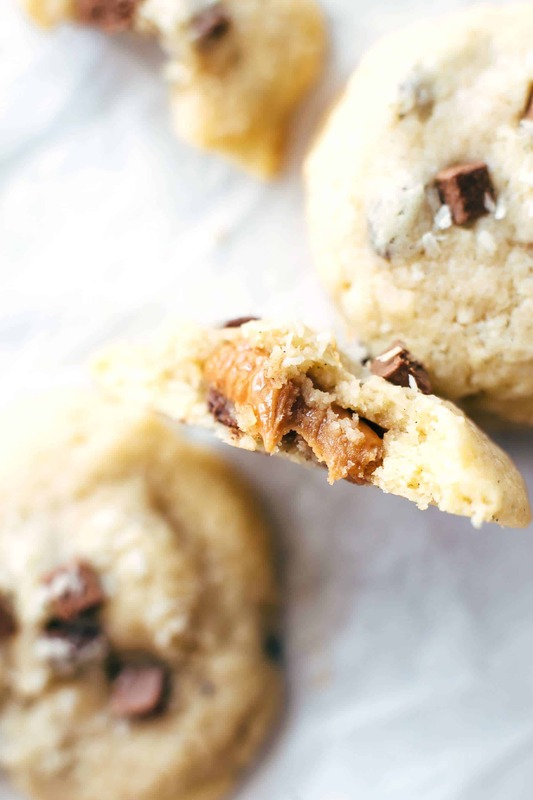 Coconut Caramel Chocolate Chip Cookies are my new favorite. Super soft and chewy. 11 ingredients and 10 minutes prep time. What could be a better recipe to start October than a cookie recipe? Exactly. Nothing! And this is not just a cookie recipe, ok technically it is just a cookie recipe, buuut this is THE cookie recipe. 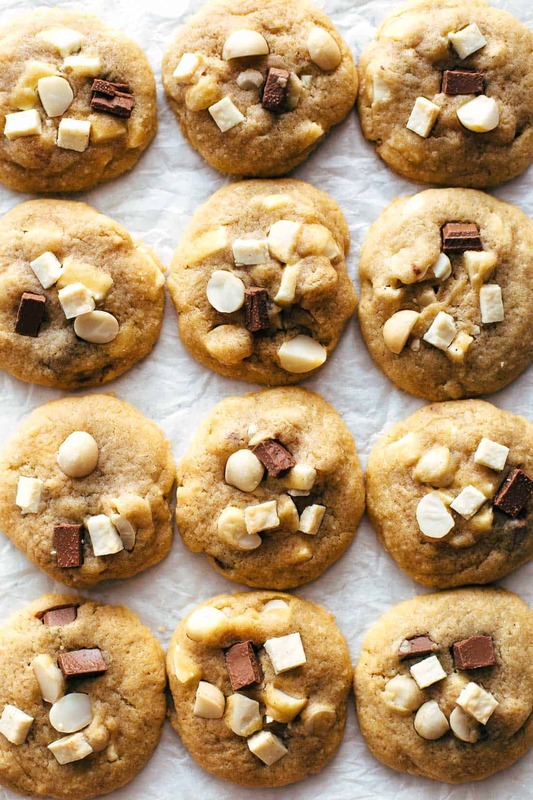 You can always count me in when it comes to centered gooey caramels in a cookie. 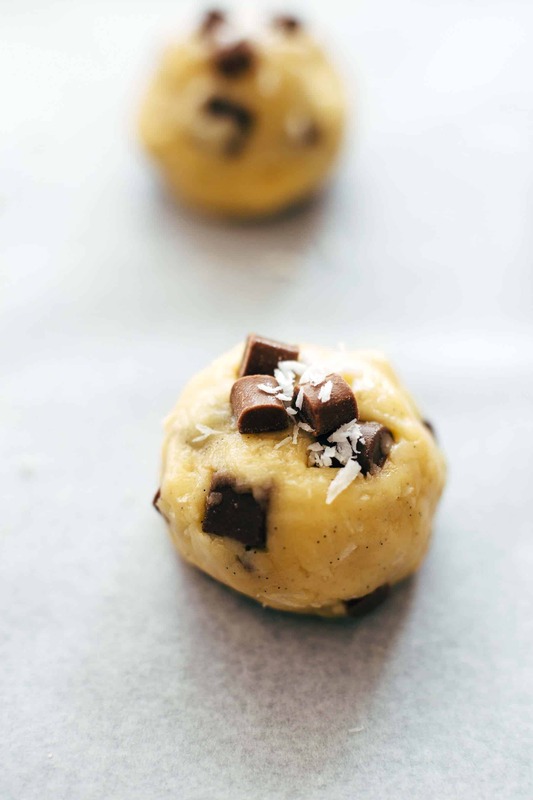 But in combination with chocolate chips and coconut? It can’t get any better. Do you consider yourself a cookie lover? Yeah, me too. Which kind of cookies do you love the most? Chewy, crispy, cakey? With nuts, fruits, chocolate? For me, I can say that I hardly find a cookie I don’t like. They are all good. Do you feel the same? That’s the proof that we are true cookie lovers. 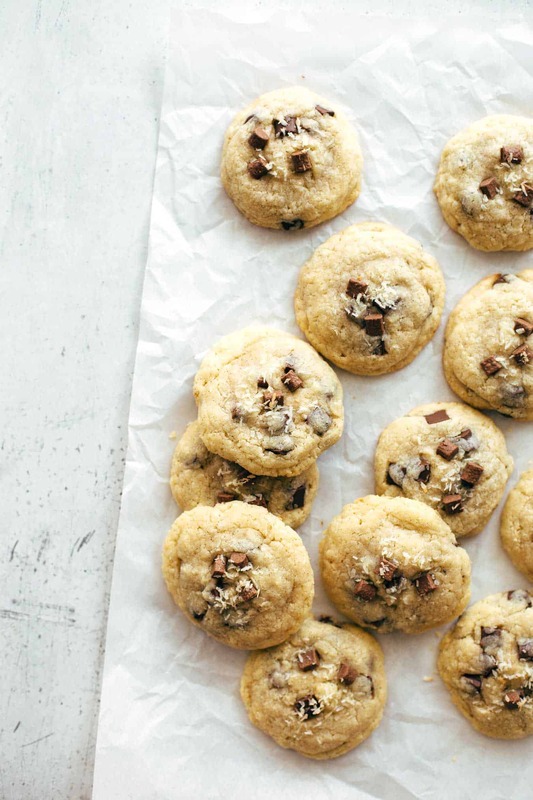 You need just 11 ingredients for this Coconut Caramel Chocolate Chip Cookies. Add 1 tsp of coconut oil to the butter. It enhances the coconut flavor in your cookies. A totally game changer. Because of the chocolate and the caramel you need just 1/2 cup of granulated white sugar. If you never used real vanilla start using it now. Not just that the flavor is as better as vanilla essence, this little black dots in the cookies are adorable too. Gooey caramel in the middle. Don’t know what to say about this?? This speaks for itself. Cookies are pretty easy to make. First, you need to melt the butter in the microwave until almost completely liquid. Then stir until completely melted. When you still have unmelted butter chunks and stir them into the already melted butter, this makes sure that your butter is not too hot. Don’t overmix at any step. This is very important that your cookies don’t end up dry and you disappointed. Just mix until you see the ingredients come together. 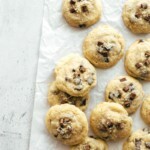 Fold chocolate chips and coconut flakes evenly into the dough. 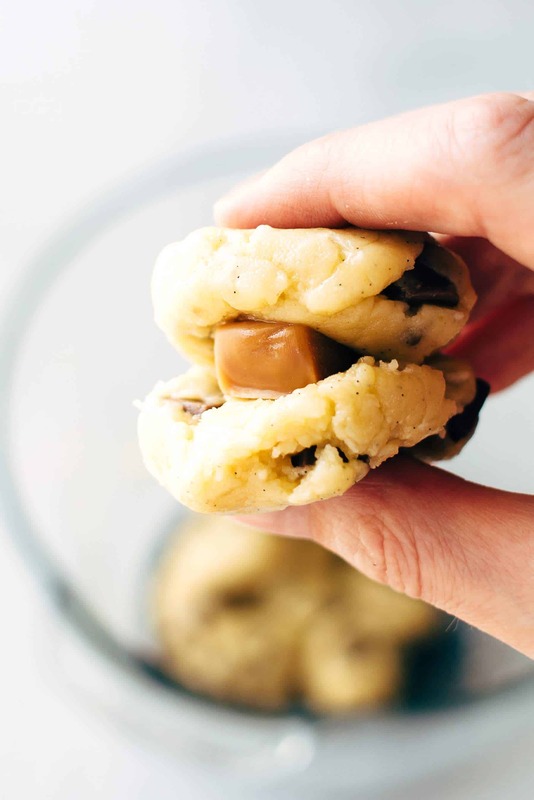 After separating the dough into 24 little pieces, take 2 pieces with 1 unwrapped caramel in between like a sandwich and roll it with your hands to a cookie ball. See the pictures above. All in all your Coconut Caramel Chocolate Chip Cookies will be ready to bake in about 10 minutes. If you make this Coconut Caramel Chocolate Chip Cookies recipe leave a comment, rate it and tag a photo #alsothecrumbsplease on Instagram! Would love to see your snap! 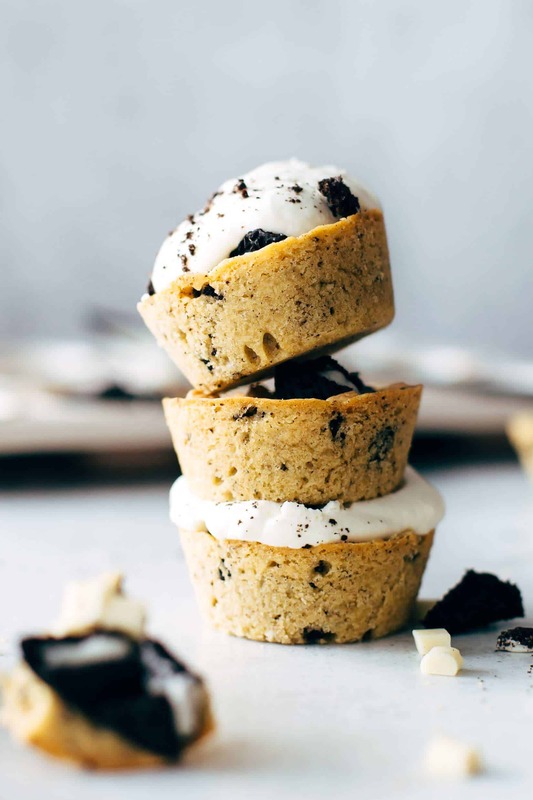 You may also like Chocolate Macadamia Cookies, Oreo Cookie Cups, Snickers Pie Cups, Churro Hand Pies, or click here to see all things sweet. Melt butter in the microwave for about 40 seconds until almost melted. Stir until completely melted. In a large bowl mix with a handheld or stand mixer fitted with a paddle attachment butter, coconut oil, and sugar on medium speed just until combined for about 1-2 minutes. Stir in vanilla* and egg just until combined. Add flour, baking powder, and salt and stir to combine. 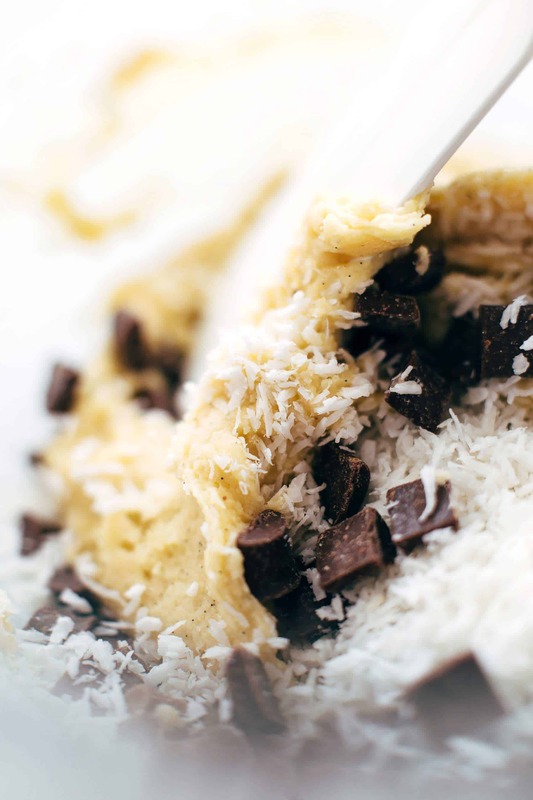 With a rubber spatula fold in coconut flakes and chocolate chips until combined. Separate the dough into 24 equally sized pieces. Take 2 pieces of dough with 1 unwrapped caramel in between (like a sandwich - look at the photo up above if needed) and roll into a ball. Place on the prepared cookie sheet. Repeat until you got 12 cookies. Place cookies on parchment paper with about 2-3 inches spaces in between. Bake for about 10-12 minutes until cookies look puffed, dry, and pale (I baked mine 11 minutes). Let cool on baking sheet for about 2-3 minutes then transfer together with the parchment paper to a wire rack and let cool completely. 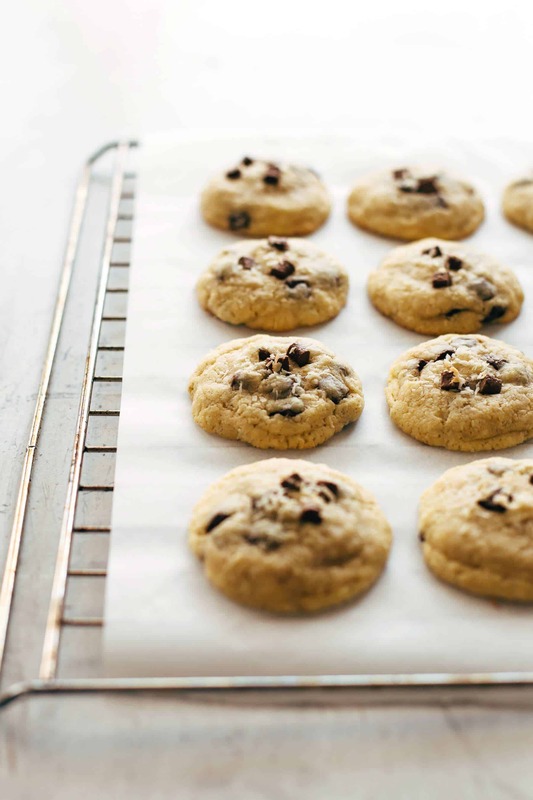 Cookies will stay fresh in an airtight container at room temperature up to 3 days.